Worlds collide! My two favorite fried finger foods combine into one sublime bite. 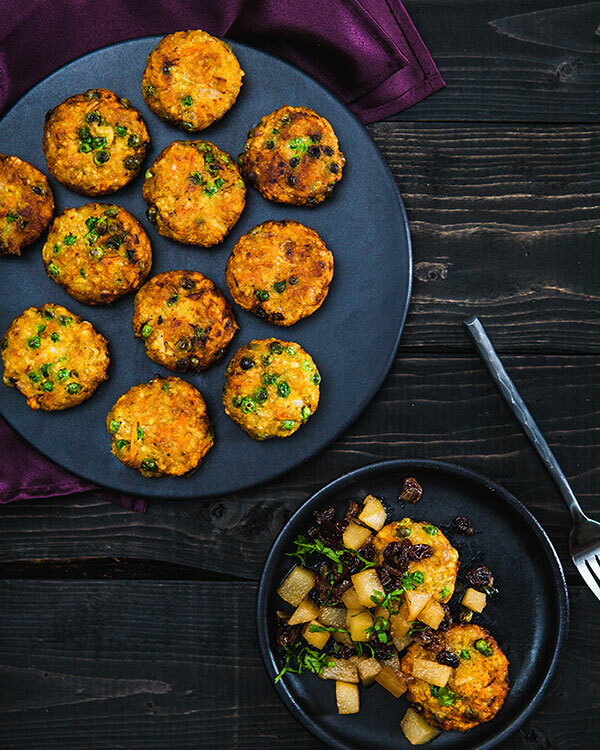 Curry powder, carrot, and peas give these potato pancakes a samosa flair, and some pear chutney seals the deal. You’ve got eight days of Hanukkah, so use one of them to break from the pack and serve these fun treats. The chutney recipe will make you want to start an artisanal chutney company in a formerly industrial area of Portland, Oregon! But if you don’t feel like making it, then apple sauce will do. 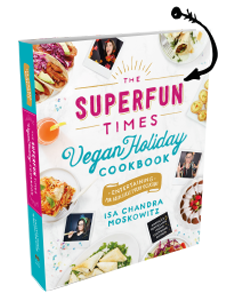 This recipe is from The Superfun Times Vegan Holiday Cookbook, along with 5 other latke recipes and a whole Hanukkah section. ~You don’t need a deep fryer to fry like a pro. A dutch oven or deep cast iron pan works jus as well. ~Make the chutney a day ahead. It’s even more flavorful if it has time to sit. If you’re using a food processor, use the grating blade to shred the potatoes, carrots, and onion, and transfer to a large mixing bowl. This may be done in two or three batches, depending on the size of your machine. If you’re shredding by hand, use a box grater to shred the potatoes and carrots. Dice the onion as finely as possible. Transfer to a large mixing bowl. Add the ginger, potato starch, curry, cumin, salt, and red pepper flakes to the mixing bowl. Use your hands to mix everything in with the potatoes, carrots, and onion. Keep mixing until the potatoes have released some moisture and the starch is dissolved, about 2 minutes. Fold in the peas. Add the matzoh meal and mix well. Set aside for about 10 minutes. The mixture should be somewhat loose but hold together if pinched. If it seems excessively wet, add a little extra matzoh meal. In the meantime, preheat a large cast iron pan over medium-high heat. Have ready some brown paper bags or a baking sheet lined with paper towels for draining the oil from the latkes. Add about 1⁄2 inch of oil to the pan. While the oil heats, form some latkes. With wet hands (so that the mixture doesn’t stick), roll the dough into golf balls, then flatten into thin patties. Get about six ready before you start frying. The oil is hot enough when you drop in a pinch of batter and bubbles rapidly form around it. If it immediately smokes, then the heat is too high and you should lower it a bit. If the bubbles are really lazy, just give it a few more minutes or turn up the heat a bit. Working in batches, fry the latkes until golden brown on one side, about 4 minutes. Flip over and fry for another 3 minutes. Transfer the latkes to the lined pan to drain, sprinkle with a little salt, flip, and sprinkle with salt again, then proceed with the remaining latkes. Serve warm, with the chutney. Preheat a 4-quart pot over medium heat. Add the coconut oil. When the oil is hot, sauté the onion with the salt just until a little softened, about 5 minutes. Add the vinegar, brown sugar, ginger, red pepper flakes, cinnamon, and star anise and stir to combine. Stir in the pears. Cover the pot and bring to a low boil. Lower the heat and simmer, stirring often, until the mixture is thick, about 30 minutes. The pears should still hold their shape. Add the lime juice and raisins and cook for 5 more minutes. Let cool and remove the star anise pods. Transfer the chutney to a sealed container and refrigerate until ready to use. This looks so delicious and I can’t wait to try it! Any suggestion for a gluten free subsitute for matzoh meal? Just use your favorite gluten free saltine-type cracker. As long as it’s not sweet, should be ok.
For those of us who don’t use matzah meal, what should we sub? Looks yummy!! My GF idea was garbanzo flour subbed for the matzoh. But oy the fat. Isa can you help us? Can’t help with the fat, it’s what Hanukkah is all about! However, there is a baked latke recipe in the cookbook as well. Maybe add a little curry powder to that? Hi Isa, these sound delish. I haven’t seen potato starch at the store — do you have any thoughts on what I could use instead? Thanks and congrats on the fun new book. Corn starch should work, too! nice! I can’t wait to try it! Hi, no recipe listed. By the way, made your red lentil Thai chili for a work fundraiser and it was the talk of whole event!!! This is amazing!! Can I freeze or refrigerate leftover uncooked latkes? No. Maybe freeze them otherwise they get moldy in the fridge. Would like to make these for my multicultural family. Can I substitute sweet potatoes for russet potatoes? Looking so yummy..I can’t wait to try it! Hi Isa, do you have a recipe for traditional latkes? Just made these, but was only able to get a cup of the matzoh meal in before the mixture was very thick. They are very delicious though. Next year we’ll try the Chutney, but for this year I served with a store bought mango ginger chutney for the adults and just applesauce for the littles. Would it be possible to avoid frying by making these in a waffle maker? A great and new dish from the familiar ingredients. Most importantly, you teach very detailed and easy to understand. Thanks a lot. I will cook for my family. Can I make this ahead of time and reheat??? sounds really good but what would I need to do to make it GLUTEN FREE? The food is great and the way to do it is simple! Thank you for sharing how this came to us! Looks super comforting! Cant wait to try this! Samosa is an Indian dish and it is very delicious. I love having it. Marinate the chicken with curry powder something like 8 hrs for genuine flavor. Darker some spread, remove the froth include some dim dark colored sugar, include a couple of TB of curry powder and a chicken juices 3D shape to initiate the flavors at that point include your meat and darker all sides. In the current era, no one is ready to purchase the train ticket by going to the railway station. With the progression of IRCTC Login Registration Verification A new account creation on IRCTC is pretty easy so that the people can generate their login credentials within a less span of time. I actually just made these as a test recipe and it came out perfect! The only change I would make is that I wouldn’t salt both sides of the latkes after frying. For me salting only one side was enough. Both the latkes and chutney were incredible otherwise. Thank you for sharing this recipe, Isa. Hope I would prepare the same samosa at my home. Thanks for the recipe, sir. Oh, it looks so cool, thank you for sharing it.